Cleaning out your closet, getting organized and practical about what’s inside of it is worth every minute of the effort. The end result makes my toes tingle with delight. Seeing neat and tidy piles of clothes can sometimes make a hectic morning seem more calm. It sounds absurd, but perfectly displayed clothing, shoes and accessories seems to have a positive impact on the way you dress. Without fail, ordered shelves and rails seem to start off my day with clarity. The easier it is to see the entire contents of your wardrobe, the easier it is to choose an outfit. 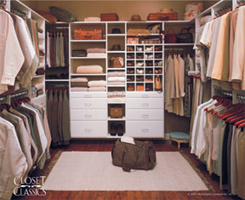 Sorting out the clothes and accessories in your closet has to be done with forethought and planning. It’s not just a question of hanging up things that are on the floor. The aim is to be able to shop in your own closet. Stay tuned on how to create a happy, efficient and comfortable personal dressing environment – rather like your favourite store. 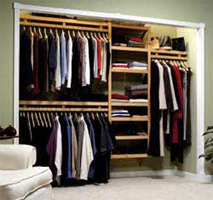 Aspirational closet organization with a little help from Organize-it-Online and Aztec Closet Systems. youlookfab » Blog Archive » Your closet: inspiration or irritation? what about those of us who are sharing closet space with a partner who is not quite so organizationally inclined? any suggestions?